A quick blog about our taking a few minutes to enjoy the musical section of Rt. 66. What, you didn’t know the actual road could be “played”?!? Well, it can! In Tijeras, NM, in October 2014, the village improved the road “musically”. Now, when a vehicle drives over it, America the Beautiful can be heard. This section of road is NM 333, between Miles 4 and 5 on the eastbound lane. The project was funded by National Geographic in coordination with the NM DoT who noted the project was an attempt to safely slow drivers down. 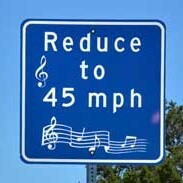 To be able to hear the music, you have to line up your right tire over the strip and drive 45 MPH. You will be driving over the rumble strips which cause a tactile vibration and the audio from that vibration “plays the song”. It is not the full song, just a clip. Musical roads exist in eight countries other than the U.S.: Denmark, Japan, South Korea, China, San Marino, Taiwan, The Netherlands and Ukraine. In the United States there are two, the one in Tijeras and one in Lancaster, California. It took us a few attempts to get it right, but we did.